For the tributary of the Matupiri River, see Jutaí River (Matupiri). 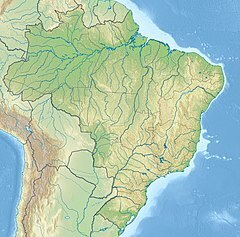 The Jutaí River (Portuguese: Rio Jutaí) is a river in Amazonas state in north-western Brazil. The river flows through the Juruá-Purus moist forests ecoregion. The Jutaí river runs northeast before reaching its mouth on the southern bank of the Amazon River (Solimões section). It is west of the Juruá River, and is roughly parallel to the lower Juruá. The 2,450,380 hectares (6,055,000 acres) Cujubim Sustainable Development Reserve, established in 2003, lies on either side of the river in the municipality of Jutaí. It is the largest conservation unit in Amazonas and the largest sustainable development reserve in the world. Further downstream the river forms the boundary between the 275,533 hectares (680,860 acres) Rio Jutaí Extractive Reserve, created in 2002, to the southeast and the Jutaí-Solimões Ecological Station to the northwest. ^ Ziesler & Ardizzone 1979. ^ RDS Cujubim – ISA, Informações gerais. ^ RDS Cujubim – ISA, Características. ^ RESEX do Rio Jutaí – ISA, Informações gerais (mapa). This article related to a river in the Brazilian state of Amazonas is a stub. You can help Wikipedia by expanding it.